We’ve had a busy week! Here is a peak at one of the activities we’ve been doing. I grew up in Maine. Every fall I would pick apples. I LOVE fall and apples and apple flavored things (and don’t even get me started on pumpkin!). I enjoy the cool crisp air and the beautiful colors. We live in Georgia. It’s 95 degrees out today and I don’t think there’s a single apple tree in the entire state. But that doesn’t mean we couldn’t celebrate the coming of fall with one of my favorite activities! I try to be frugal with our activities. Staying home to be with X makes us a one income family and that’s not always (or ever) easy. I constructed the tree out of tinfoil, some rubber bands and an empty box. You could certainly purchase a small wire tree, or be creative with what supplies you have on hand. 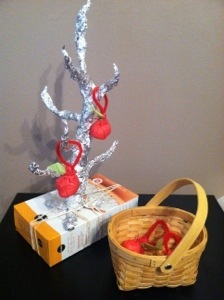 The apples are tissue paper, pipe cleaners and string. I would have preferred brown pipe cleaners, but red is what I had. I was trying to construct the whole activity without buying anything. Some glue (probably hot glue would work best) would have been really helpful in keeping the pipe cleaners attached, but I just retied them if they broke and it worked out fine. X really enjoyed this activity. It was great dexterity and fine motor work. Building Attention Span and Focus: It’s the single activity that holds X’s attention the longest. I try to find activities to help him build his attention span and play dough fits the bill. “Attention span? He’s 18 months!” you may say, but we are setting the foundation for his ability to focus the rest of his life. Believe it or not a child’s (and eventually adult) ability to focus is something that is established very young. Attention span is however similar to a muscle and can be repaired and built up later in life, but if you lay a great ground work early on you may be able to avoid a lot of behavioral and learning issues in the future. Now, when I’m talking about a toddler’s attention span I by no means hours spent on a single activity. There’s just too much going on in their busy little minds! X generally spends about 20 minutes using play dough in the morning and then revisits it for shorter spans through out the day. Other activities hold his attention for 10 minutes or less with the exception of larger arts and crafts projects. Building Muscle, Fine Motor Skills and Hand Eye Coordination: Using play dough works the muscles in the fingers, hands, wrists, arms and shoulders. Pushing, squishing, ripping… you name it! A lot of muscle toning is going on there! Using tools and some of the activities we do take great finger, hand and wrist control and really helps develop those fine motor skills as well as hand eye coordination. I try to create a variety of activities where X uses tools, but play dough is the easiest way to do that. Inspiring Creativity and Imagination: Whether he’s creating patterns, burying and excavating farm animals or making sculptures those creative wheels are turning! 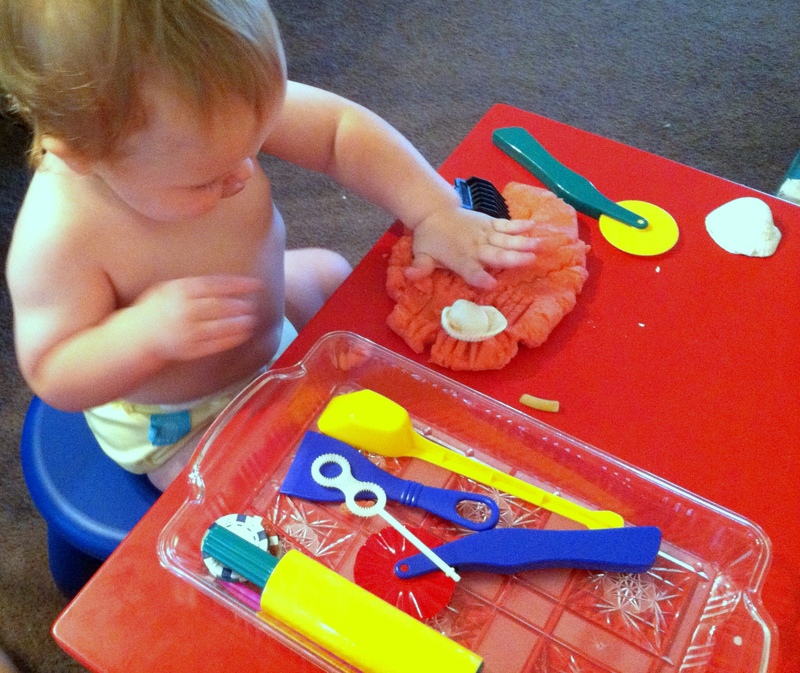 It’s often hard to find creativity and imagination building activities for young toddlers. Their language skills and understanding of the world are somewhat limited so they’re not making up stories or playing house. Play dough is a great opportunity for them to express themselves and ideas. 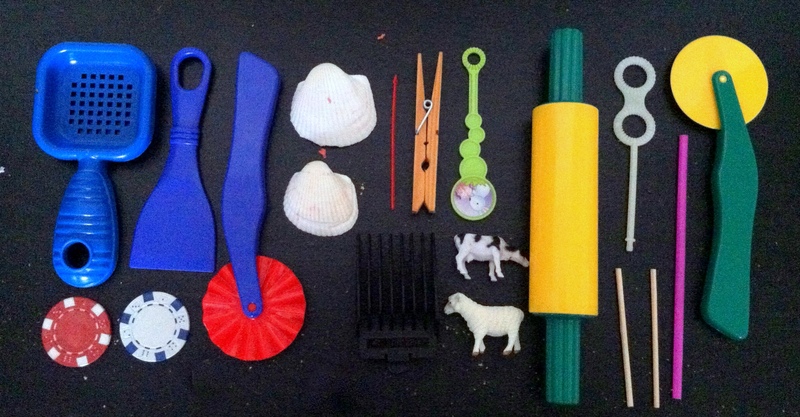 Building Language: We talk about colors, shapes, textures and motions. “Squish the ball!” Mommy made a triangle” “This tool is blue” There are many opportunities with play dough to introduce words and explain concepts. It’s Fun! Who doesn’t love play dough? Building faces. I often make an oval and construct eyes, nose and mouth. X puts theme where they belong. He often helps me create and apply the hair. He loves naming and pointing to body parts, so this is a favorite of his. Fine motor sorting. I flatten out a piece of dough and create small indentations with my pinky. Then I roll a bunch of small balls that will fit in the indentations. X places the balls in the holes. sometimes I do them in shapes or we count as he places them in the holes. Big and small. This is a great way to introduce the concept of big and small. Sculptures. 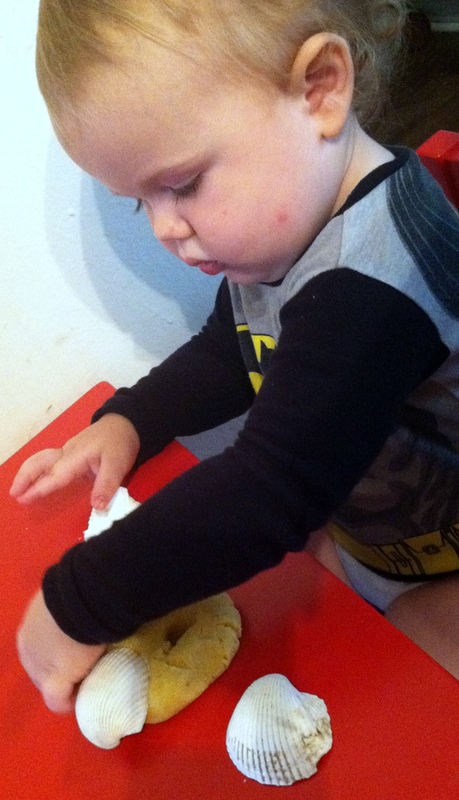 X loves taking a mound of dough and making sculptures by sticking the tools in at different angles. Textures. We use our tools to create different textures and patterns. I demonstrate how to make a texture and X copies. He’s also now starting to make his own textures and patterns. Dough slicing. I flatten out long strips of dough and X uses our pizza cutter style tools to slice it. He has to focus at pushing the blade the full length of the dough. This also builds wrist strength and hand eye coordination. Combine all ingredients in the non-stick pot. Cook and stir over medium heat (my stove top runs hot, so it may work quicker at med-high for some of you). The dough will get slightly darker and have a rubbery (or finished play dough) look to it once it’s cooked enough. It really doesn’t take long at all. Knead a few times to make sure it is well combined. I think X is going through a “sensitive period” for order. Montessori speaks about children being more receptive to building different skills at certain times. She referred to these times as “sensitive periods”. If we as parents, teachers or care givers can observe when these periods are happening, we can provide tools and activities to maximize them. Forcing the Bloom made a great post here about observing our children. I have yet to take notes on my observations of X, but it’s a GREAT idea! I do however reflect on what I’ve noticed about his habits and play to better provide him with projects and Montessori inspired work. This activity is one of those. 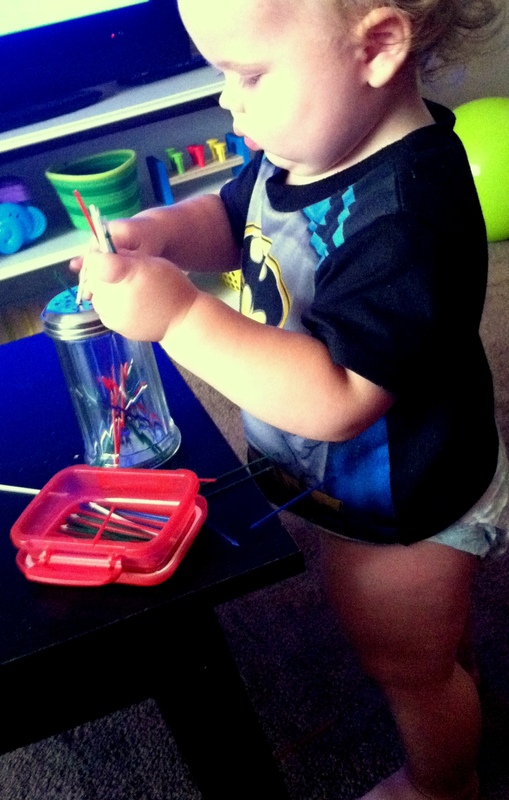 X helps put away his toys and activities; if normal things in his environment are out of place he fixes them. I ask him to assist me in picking up, carrying in groceries and cleaning the house. He very obviously enjoys the meaningful work. Sorting items is not only supporting a need for order and fine motor development, but it is also early math work. Not only is it great for building skills, but it’s easy to set up and very inexpensive. I purchased this egg tray for a dollar. 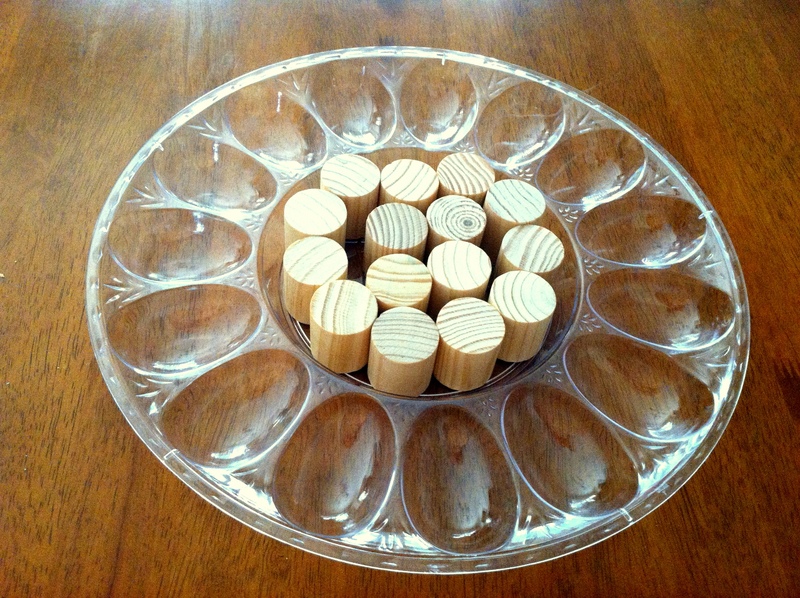 I pulled these wood pieces from a set of building blocks we have and VIOLA! I encourage X to place the blocks in order as opposed to randomly. Sometimes he does, sometimes he doesn’t. To further the math experience and add a language component, we count as we place each block in it’s spot. This could also be used as a great matching set up when he gets older. 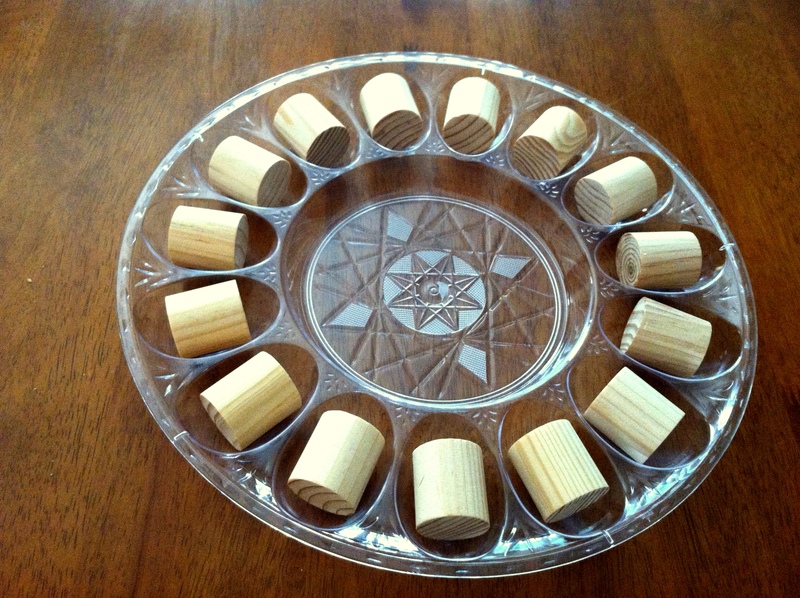 Colored dots, shapes or numbers could easily be applied to take this activity to the next level. Stay tuned, I will be making a post later this week about the practical life activities we’ve been incorporating into our days!